Barfi! is an Italian-French dramedy set in the 1970s about three people who are seeking love and acceptance. Jumping between Verona, Italy and Brittany, France, Barfi (played by Roberto Benigni) is a deaf-mute who unintentionally gets into trouble with a chubby police inspector (played by Michel Blanc) always on his tail. Barfi falls in love with gorgeous Shruti (played by Monica Bellucci) but she’s already engaged and pressured to marry a man she doesn’t love. Even as she eventually falls in love with Barfi, Shruti gives in to pressure from her mother, chooses to live a typical life with the man she does not love, and moves away. Heart-broken and dealing with his father’s job loss and health problems, he tries to rob a bank to pay for an operation his father needs. When his bank robbery plan fails, Barfi decides to kidnap and hold for ransom the daughter of his father’s ex-boss – a sweet autistic woman named Jhilmil (played by Nicoletta Braschi). This plan fails as well, and no matter how many times Barfi tries to free Jhilmil, she becomes emotionally attached to Barfi the likable clown. He gives up trying to get rid of her and lets Jhilmil tag along with him as they both run from the law. Some years later, Barfi runs into an unhappily married Shruti and all three end up developing a unique friendship. There begins a love triangle – who ends up with who? Barfi! is a heartwarming film with Chaplin-esque comedy, tear-dripping drama, perfect direction, powerful performances, and a unique story. While the film may be too commercial to be Oscar-nominated for Best Foreign film (as it was the film that India submitted to the Oscar’s Best Foreign Film but wasn’t selected), Barfi! is my favorite foreign movie of the year. I had heard many positive things about this Indian film but I was a bit cautious. After all, the title of the movie sounds like “The Man Who Liked to Vomit” to me. I am also very skeptical about any new movies that tackle the mentally handicapped genre because they end up looking like a parody. As quoted in Tropic Thunder, “You went full retard, man. Never go full retard.” Right now in India, they love making movies about mentally-challenged characters just as Hollywood did in the 1980s and 1990s but the genre was eventually killed off by the painful-to-watch Jack, Patch Adams, Radio, The Other Sister, and I Am Sam. But Anurag Basu’s Barfi! managed to pull it off as another great entry into the respectable “mentally-challenged” film list that includes Rain Man, Forrest Gump, Being There, Awakenings, and Temple Grandin. Wisely, the performance from former-Miss World Priyanka Chopra playing autistic Jhilmil goes for the “less is more” style of acting mentally-challenged. While many popular Bollywood actresses such as Aishwarya Rai and Kareena Kapoor typically act the way a glamorous star should act, Priyanka Chopra has been surprising everyone with her skillful acting chops to a point where this “Charlize Theron of India” has turned into one of the best actresses in India – she has been choosing all kinds of roles in her last bunch of films – I would have never guessed that she would become such a good character actor with diverse roles. Usually in Bollywood films, the actress is just there to support the main actor who is basically the cocky superstar athlete on a basketball team. In Barfi!, the two leads support each other equally. While we aren’t talking Daniel Day-Lewis and Meryl Streep here, it’s pretty close – Ranbir Kapoor and Priyanka Chopra give outstanding performances and work together perfectly as two superstars on the same team. Ranbir Kapoor’s Barfi is pretty damn amazing. Inspired by Charlie Chaplin, his performance as a likeable baffoon is quite special to watch. When most Bollywood movies are plagued with infinite filler and awful dialogue that bloats the running time to over three hours, Barfi! has accomplished something never before in a commercial Indian film – the two main leads rarely talk. When Barfi speaks, he only says his name. When Jhilmil speaks, she only says his name. All the communication is visual as if the audience is watching a silent film starring Charlie Chaplin and Paulette Goddard. Never did I feel bored watching this 151-minute film that featured plenty of scenes with no dialogue. The only thing that made the movie seem longer than usual are the many musical montages of the characters getting to know each other. But if there weren’t those musical montages, then Barfi! would have trouble showing time passing for the characters. So actually, I don’t even think that trimming the montages would have made the film better. Yes, the movie is long but no scene is wasted. The most impressive aspect of Barfi! is the greatest direction I have ever seen for an Indian film. If you have ever seen films from Jean-Pierre Jeunet (Amelie, A Very Long Engagement) and Julian Schnabel (The Diving Bell and the Butterfly, Miral), you will be very pleased with the direction by Anurag Basu. I’m not just talking about the beautiful cinematography of Calcutta, Darjeeling and other landscapes – the way he frames each scene is a total work of art. I’ve been intrigued with Basu’s past films as he has been one of India’s controversial directors. In 2004, he directed a remake of Adrian Lyne’s Unfaithful called Murder. I checked it out because it included infamous kissing scenes (naughty for Bollywood). In 2006, he directed a crime film called Gangster that was very popular in India. And in 2010, he directed Kites which had an interracial romance of an Indian dude falling in love with a Mexican girl, and it took place in America. All three films were worth checking out, but nothing really memorable. I thought Basu was a controversial director – nothing more. But after watching Barfi!, I would have never guessed what a talented director he is. After Barfi!, Hollywood will be contacting him! The Region-free Blu-ray from UTV/Reliance Home Video is as good as it can get for a Blu-ray from India – excellent 2.35:1 1080p video quality, engrossing Hindi DTS-HD 5.1 that highlights the film’s catchy music and Amelie-esque accordian score. The English subtitles are perfectly translated, the Blu-ray menu is pretty to look at, and there a couple of extras such as a 50-minute making-of, a short featurette, and some deleted scenes. This is a perfect package that comes with a Blu-ray slipcover as well. I would like to note that there are just a few minor distractions with the video. First, there’s a “cigarette cancer” warning that pops up in the corner when any character smokes. Second, there are two very quick instances of macroblocking during two separate scenes. Both last a second, but they are there and should have been caught by quality control. So what are you waiting for? Check out the best “European” film of the year! There are other summaries and reviews online if you want to know what happens throughout this film, but I don’t want to ruin it for you. Watch the trailer and you’ll know what to expect. I will say though, that since its release in 1998, The Barber of Siberia is still one of the best contemporary and satisfying epic Russian films I’ve seen. Nikita Mikhalkov, my favorite Russian director, has been considered to be very nationalistic, but I consider him one of Russia’s most accessible directors in which his movies are satisfying for everyone around the world – sort of like the Steven Spielberg of Russia. If Mikhalkov had submitted this film to the Best Foreign Film submission, it would have probably won. He didn’t submit it because he’s got issues with Hollywood (remember, he’s very nationalistic). But that doesn’t stop him from using talented Hollywood actors. For fans of Julia Ormond, this is her film – her “Gone with the Wind” role. It’s sad that a lot of her fans haven’t seen this film because The Barber of Siberia is her best film. The great late Richard Harris also stars in this film, one of his last great roles. The movie is also full of talented famous Russian actors who get to show off their talent because, in Russia, movie directors rarely get to show off their good actors because the Russian movie industry is still pretty poor. The best Russian actors tend to stick with where their talents are respected – on mafia/criminal/cop tv shows and theater. The Barber of Siberia has been released on sketchy DVDs over the years. It’s been on a French DVD with forced French subtitles, I think there have been some letterboxed or full-screen Hong Kong or Korean versions. There’s also a UK DVD but I have no idea if it’s anamorphic or not. Fortunately, Russia’s “Criterion-type” DVD company RUSCICO released an NTSC Region-free DVD of this film with anamorphic widescreen video and DD 5.1 Russian/English (much of the movie has English dialogue too). The video quality is generally clear and sharp through out. Colors are soft and muted yet they still stand out, especially with all the changing seasons in this film. It’s an old DVD so don’t expect it to be amazing looking, but it’s a totally pleasing presentation. The DD 5.1 Russian/English is a wonderful active mix – the movie has plenty of scenes which make the audio stand out – from sword-fighting, to trains, to machinery, and to music. Dialogue is clear as well. This audio soundtrack totally compliments the picture quality. The extras, such as an interview with the director and trailers, are not subtitled. The English subtitles on the film are perfect. Please note that there are two RUSCICO dvd versions of this film. One is an English-subtitled version (this one) and the other one does not have English subtitles (and I think the other one may be the PAL version). If you like sweeping epic-style David Lean/Steven Spielberg films, you’ll love The Barber of Siberia, a perfect combination of drama, humor, romance, and action. 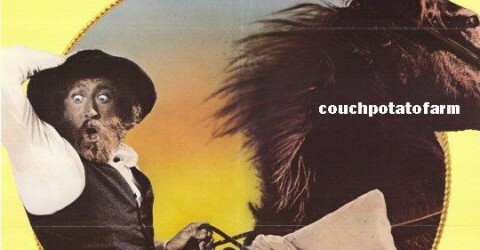 It’s too bad this film hasn’t been released on blu-ray yet because this moving masterpiece was created for blu-ray. The Blue Umbrella is an excellent film. Period. Even though there are three songs in this film, I wouldn’t classify this film as a Bollywood film. It’s just a great film from India. The movie centers on two characters, played by a little girl and an elder man, both mesmerized by a Japanese umbrella that found its way into their mountain town. The movie is totally touching as it explores greed, generosity, jealousy, vengeance, and redemption. This film can be enjoyed by everyone and it’s not a “family” film. It’s just a great film. The Blue Umbrella is also very similar to The Gods Must Be Crazy, only that instead of a Coke bottle causing a fuss, it’s this blue umbrella. The direction by Vishal Bhardwaj is first rate – his shots are beautifully filmed and the whole movie moves along at a very nice pace. The young girl and elder man are also excellent in this film. Great, great film! The Moserbaer Region Free blu-ray is just totally solid. The video quality for the majority of the time is excellent. There are many artistically filmed dark shots, which may be less in video quality, but overall, the video on this blu-ray is just totally pleasing! The DTS-HD Hindi is also very good, with very active surround sounds. The English subtitles are pretty good as well, some spelling and grammar mistakes but nothing that bad nor distracting. The only extras on this blu-ray is the Song Menu. Also, there aren’t any advertisements or logos that pop up during the film. Just a great solid blu-ray! Moserbaer does a dramatically better job on their blu-rays than on their DVDs! 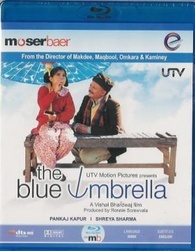 The Blue Umbrella is one of the best Indian films I’ve seen and I highly recommend blind-buying this film!